Did You Ever Think of A Meat Garden? Why not raise meat in the garden as well as vegetables? There is no reason why chickens cannot be kept successfully in a town or village lot, provided they are kept in the sanitary condition that is just as essential to the health of the fowls as to the health of the community. Many a family could keep a few chickens, not to make a fortune on selling eggs, but to raise this quick meat for table use or to supply the table with eggs. The objects attained in keeping chickens for the use of the home table are fourfold: Fresh eggs daily for the children year round; increasing the food supply; raising meat in a short time for the table; saving money on the meat bill. I had a few chickens when I lived in a ‘county pocket’ that was not subject to city laws. The difference in fresh eggs as compared to store-bought is dramatic! I try not to think about how old store bought eggs are. The last I heard is, if they are kept at the proper temperature, they will last approx. 2 to 3 years. Is that what you’ve heard? I’ve never thought of it as a “meat garden.” That is an interesting way to look at it. It is a much broader definition of garden than what we use today – though it makes sense in some ways. My grandfather had chickens for eggs. The thing I recall the most is that they all died old age! Each one had a name and each one was loved. Naming the chickens enabled each one to be seen as a unique creature. The debate makes front page news. The debate over backyard chicken ordinances also makes news in the town where I live. I think that each property may have no more than 4 chickens – no roosters. Some people thing that is too restrictive; others think that chickens should be banned. I always wanted chickens – but who takes care of them when you gone? You can board dogs – but chickens? I’ve also thought about getting a few chickens, but the logistics of actually owning them seems way too complicated. You can have chickens in your backyard in parts of our town as long as you have no roosters. The rules regarding chickens where I live sound very similar to the rules where you live. Loved this glimpse into the past, Sheryl. My mother and my mother-in-law both talk about the chickens they had in the yard as kids, a big part of their daily existence. I think that we’ve lost something important over the years. 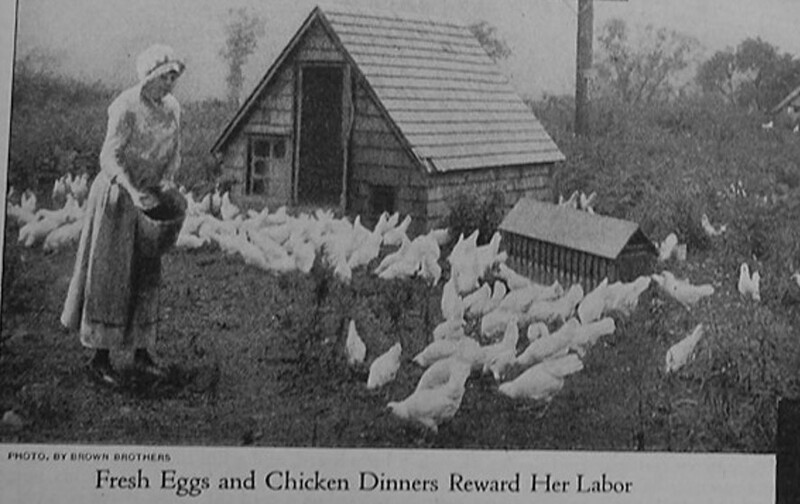 My grandparents had chickens in their backyard well into the 1950s and they lived in a city. It’s something that I haven’t thought much about, but it almost seems like many of the rules and regulations regarding the raising of poultry in towns were enacted during the latter half of the 20th century; and that now they are being loosened in many areas because people would like to have a few chickens. I so enjoy my chickens! Except for the occasional rooster that thinks he owns the farm😁 but he makes wonderful chicken and dumplings supper if he gets too nasty.🤓 I get different chickens for meat than I do for eggs. Saves more on the feed bill,as my layers are a lighter bird, that don’t have much meat on them.i don’t think you save much by raising your own,but sure taste better! You’re lucky to have your own chickens. I grew up on a farm where we just had a few, and it was wonderful to have fresh eggs, but I have to rely on store-bought eggs now. Great post! I have a book that’s been passed down through the family called “Household HInts and Mrs. Curtis’ Cookbook. It has all kinds of hilarious tips on raising chickens and other homemaking chores of the day. My favorite is to throw wet sawdust on the floor before you sweep, to catch all the dust particles. Hopefully, you have wood floors and not carpet. The book sounds a fun read. Can you imagine putting wet sawdust on the floor today? You always find the most interesting things to post! I loved having chickens for a few years when I lived in California. I couldn’t eat them, but loved the eggs. I love browsing through hundred-year-old magazines. I’m often amazed by the articles that I come across. I don’t have chickens, but I have a friend who has quite a flock of free range birds, and the eggs I get from her are beyond marvelous. There’s no comparison when it comes to taste, and besides — the varied colors of the shells are delightful. It’s like having Easter eggs without having to dye them. There are some breeds of chickens that lay eggs that have beautiful colors – No need to dye them. I love the idea of a meat garden. Our neighborhood prohibits it, though. The suburb where I live used to ban chickens. I was surprised a few years ago when some residents really started pushing to get the ordinances regarding chickens changed. And, I was also surprised that they were successful. .
That is marvelous! Cluck! Cluck! Your trip to the Dominican Republic sounds wonderful. It’s fascinating how different areas have different rules regarding the raising of chickens. I’ve never heard of a chicken pen being called a meat farm! It’s interesting how the word “farm” suggests a certain size of the operation – though what that size is varies across location and time. I just wanted to let you know that I enjoy reading your blog quite a lot and that I’ve nominated it for the Sunshine Blogger Award. You’ll find all the details in my latest blog post. I’m honored that you thought this blog is worthy of the award. Thank you. Enjoyed your write-up and the comments. My mother is over 100, and she’s often told me about the chickens her father and uncles raised as kind of a side business. They lived in an early suburb, the kind that grew up along railroad lines. But apparently raising chickens was a thing. There were poultry clubs that had competitions, and the results even turned in up the local newspaper. My grandfather and his brothers raised chickens that laid brown eggs, because they could sell them for more money. They’d pack up the eggs and send them up to NY City on the train. They did use older chickens for meat, I guess when they stopped laying. Thank you for sharing. It’s fascinating that people in some of the early suburbs were not only able to raise chickens, but that they were able to do it on a large enough scale that they could sell eggs in the city. This post sure took me down memory lane. I miss the days of having fresh chicken and fresh eggs from the backyard. I had my last chickens in 1968. I miss them, too. I grew up on a farm where we always had a few chickens – but those days are long gone. Daddy had chickens as a child, and the stories he would tell!! Raising chickens can be a fun adventure! I used this entry for inspiration for a post on my blog. Once again, the topics here are always so interesting. It’s always wonderful to hear that one of my posts was an inspiration for a post on your blog.